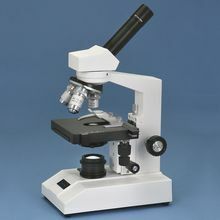 Wolfe® CFL Educational Microscope with Mechanical Stage is rated 5.0 out of 5 by 1. Carolina&apos;s quality Wolfe® CFL Educational Microscope with Mechanical Stage is well designed, versatile, durable - and an exceptional value. Enjoy the features that you need including inclined, rotatable head, in-base fluorescent illuminator, and iris diaphragm. Grades 9-12. If you&apos;re looking for an educational microscope that&apos;s well designed, versatile, and durable, Carolina offers you an exceptional value with our quality Wolfe® CFL Educational Microscope with Mechanical Stage. 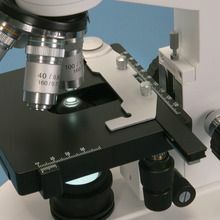 Cool performance - This high school microscope has fluorescent illumination that radiates little or no heat compared to lower-priced models with tungsten illumination - a very important benefit when you&apos;re working with live microorganisms. Fluorescent light is also whiter and promotes longer bulb life. The focus mechanism has separate coarse and fine adjustments, incorporating travel stops and a slip clutch to protect slide, objectives, and focus mechanism. Cool options - This model has a built-in stage for smooth slide positioning. Cool value - Get the features you need, including an inclined and rotatable head, in-base illuminator, and iris diaphragm, at an affordable price. 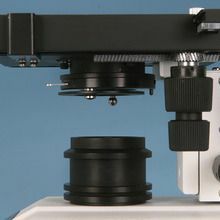 Quality DIN (Deutsche Industrie Normen, an industry standard) optics include a widefield 10x pointer eyepiece and 4x, 10x, and 40x objectives. The 40x retracts to prevent possible slide damage. Locked-on eyepiece and stage clips protect against loss and tampering. 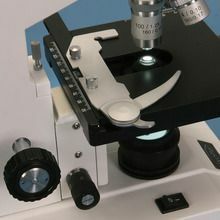 Rated 5 out of 5 by GTSciTeach from Great microscope for middle school My students find this microscope easy to use in class and it is useful to see all of our slides. 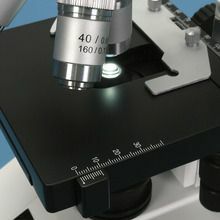 The microscope has a cord long enough for classroom use, is easy to store and even comes with a cover for storage.